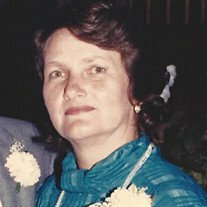 Lou Ann (Maple) Jaeb, age 82, passed away Thursday, February 7, 2019, at St Luke's Lutheran Community in North Canton. She was born August 14, 1936, in Elkins, West Virginia, to Lloyd and Luella (Hartley) Maple. Lou Ann attended college and was employed as a teacher. Her husband Thomas, was a former minister in the Friends Church where she was very active and taught Christian values. She loved her family, her dogs and being a grandma; having attended many of their sporting events. Survivors include her children, Vivian Groves, Ann (Tom) Krabill, Margaret (Dale) Eshelman and Tom (JoLynn) Jaeb; grandchildren, Tricia Glasspell, Heather (Aaron) Deem, Amber (Mark) Patti and Mandy (Brett) Scott; great-grandchildren, Abby, Carter, Kyle, Jabe, Dylan, Liam, Taylor and Gunner; and a sister, Cynthia (Rob) Lanchester. In addition to her parents, Lou Ann was preceded in death by her husband, Thomas Jaeb, August 14, 1998; son, Paul Jaeb, October 29, 2018; brother, John Maple; and sister, Deborah Maple. Services will be held at 11 a.m., Tuesday, February 12, 2019, at Cassaday-Turkle-Christian Funeral Home. Friends may call from 10-11 a.m., prior to the service. Interment will be at Fairmount Memorial Park. Memorial contributions may be made to the Louisville Christian Church 1800 S. Chapel St, Louisville, OH 44641. Arrangements are by Cassaday-Turkle-Christian Funeral Home, 75 S. Union Ave. Alliance, OH 44601.